PRO 1200SEMAX Motorcycle Lift Package Includes Side Extension Kit, Rubber Lined Wheel Vise, and Service Jack. PRO FRONT EXTENSION is for use with the PRO 1200 Motorcycle Lift and has 3 settings. It is adjustable from 84" to 97" or 110". PRO WD WHEEL DOLLY FOR MOTORCYCLE LIFT WORKS WITH PRO 1200 MOTORCYCLE LIFT. Fits eatly in peg in back of lift when lift is in down position. Heavy duty construction on wheels and tubing. Lift Height: Collapsed 7-1/2" full height 32"
PRO 1200 Motorcycle Lift package is one of the most affordable, best packaged lifts on the market today. It is ideal for Motorcycles, ATVs, Lawn Mowers, Snowmobiles, and more. Lift table deck measures 24" x 84". Lift weight is 375 lbs. Works great The lift is a great value. Clark was pleasant to deal with. In the future i wouldnt hesitate to purchase from NH pro-equip. I had a great experience with NH Pro Equipment. The lifts I bought were everything and then some for what I expected. Will definitely look forward to doing more long term business with Clark. That guy that just bought the red and black lift w/all the accessories was a referral from me & he was very impressed, also! I'm very pleased with the pro 1200 lift I purchased. I'd recommend it to anyone. Well built, sturdy, strong, and very professional for any shop or home mechanic. Thank you. This is a good, sturdy lift. Thank you. This is a good, sturdy lift. It's better than I expected. It is good quality, and has a smooth up-and-down motion. This company is a pleasure to deal with, and I would recommend this lift to anyone. Hey Clark, got the motorcycle lift and accesories today and it is great!! Already working on one of my bikes and couldn't be happier with it!! I willl let others know where I got it from and let them know of your great service. Thanks for the great service!! Lift is heavy duty & well constructed, easy to put together and at a great price. Shipping was fast and reasonable. Clarke followed up with several calls to ensure total satisfaction. Would purchase from him again. This lift is more than I expected, very securely holds and lifts my Gold Wing 1500 @ 800 lbs. i wasn't so sure at first but as i lifted a little at a time i have gained confidance the bike is as secure on the lift as on the floor(with straps and on centerstand). I have used my small pancake air compressor to easily lift my bike. the lift construction is robust and comparable to the more expensive lifts. The red deck and black side extensions are real eye candy, looks great next to my Snap-on/Kobalt tool boxes. The red deck is nice contrast color, your tools and any nurt/bolts stand out better than on the black sides. The red seems to reflect light up under the bike for better visability. Enhancements i want (will) make for my bike, longer ramp the gold wing is hard to push up the steep ramp as delivered need about 28"-30" long ramp for one person loading. tie down points are too narrow for the gold wing width, i plan some 11 gage hoops for over the side extension support pipes at front and back to provude greater stability. other than that this is a bargan for a personal lift and easily ruged enough for a business daily use. Want to thank Clark & Fred for all their help! Just want to thank Clark & Fred for all their help and advice they gave me while searching for the right lift for my 2013 H-D Ultra Tri-glide limited edition. I purchased the Pro 1200SE and am very happy with it. When it arrived, the contents were damaged through no fault of NHPROEQuIP. The shipper was less than careful and it was my fault for not noticing the damage prior to signing. Called Clark and he said he would send a new ramp right away free of charge. I told him I could get the dents out and make it work but he insisted on sending the new part, saying it is new, you don't want damaged parts. It is near impossible to find customer service of that caliber now a days and if I ever need another product the Heintzs' Brothers carry, I will purchase from them even though it may be cheaper elsewhere! They are that good. Thank you again, Clark & Fred, for making this purchase such a pleasure!! Very easy to put together, lift works very well, very pleased with it. Putting the extension on was quick, took about half hr. Received and tried out. Lift works very well. Excellent customer service and support. Clark personally followed up on all my questions. Shipment was great, well packaged and arrived next day. Clark, it's clear that you and your employees are there for the customer. Thanks to you and your team for an easy and pleasurable experience. Received in unbelievably record time! I received my lift and package in unbelievably record time. Set it up and worked as advertised. Thanks for the great customer service. Everything it said it was - well made and thick steel. Very quick shipping and free, plus living in NY I didn't have to pay tax. They even got me lift gate service at no charge! I added traction tape and rubber sides on the wheel chocks. My friends are in envy of me. Wish it came with a lift bar to move it around, but I'll make one or buy one. Got the red and black one. Clark was very pleasant to talk to. I will recommend this lift package to anyone. Ordered the PRO 1200 MAX Package from Clark on Monday evening, shipped Tuesday and by 10:00am Thursday it was delivered to Chicago! 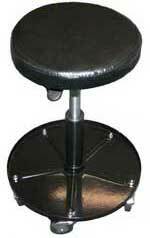 The lift is very good quality and has exceeded my expectations in strength and durability. I would highly recommend this lift package to anyone who is looking for a motorcycle lift. I lifted my Street Glide on the lift after setting up and their was no bow in the table, the lift went up smoothly without struggle and went down just as smooth. I want to thank Clark for the SUPERIOR CUSTOMER SERVICE HE PROVIDED! From start to finish, Clark sent updates on shipping, tracking information, estimated arrival time and followed up to make sure the lift was delivered as promised. Thank you for providing a quality product and a smooth stress-free transaction! Lift arrived in less than 24 hrs. Thanks again Clark . The lift arrived in less than 24 hrs. Up and running good. Hi Clark, the lift worked out great just put the wheel ext on and turn the lift backwards and the sides on with the ramp on them. A lot of drag sleds out there that would love to be on this. Clark, thanks for all your help in getting me my lift. I did add some added safety items to it such as non-slip 3M tape. I was concerned that if any oil or grease was to drip I'd fall and drop the bike. It lifts my bike with ease using my pancake compressor. I definitely feel secure when using it. I also use it to store my wife's Road Glide Ultra to save space. That makes her happy now that her tires won't get dirty. Thanks, again. The lift is well constructed, sturdy and solid. Clark's customer service is excellent. He answered all questions and sent tracking info the minute the order went out. He's a pleasure to deal with and I would definately order from him again. I purchased a pro 1200 lift from you for my roadking classic. I looked at a lot of lifts you guys had the best deal and the best looking lift for the price. I would buy from you again, thanks for the deal. Lifts my H-D Ultra Classic! Clark, I am very satisfied with my new pro 1200 lift. It lifts my h-d ultra classic (heaviest bike h-d makes). It was shipped in 4 days. I appreciate all of your help over the phone. I would highly recommend this to anyone with a motorcycle. This could easily be rated as a1500# lift. Put it together in 1 hr and 20 min. Very Happy! Love our new bike lift,works awesome. and a great deal! I was really impressed on the quality of the lift once is was out of the crate. From the pictures it doesn't look as nice as it does in person. Very sturdy with my 975 lbs + Ultra on it. Very glad I spent the extra money on this. Everything arrived safely and it works great! The Lift was delivered on Friday as planned. Everything arrived safely and it works great! Thanks for the good customer service all the way around. I would definitely recommend it to a friend when I bought it I picked it up myself and they put in in my van for me. I had no problem setting it up or assembly. I dealt with Clark when I bought it, great guy to deal with. So I've never been back because I didn't have to. But if I need anything else I will definitely give NH Pro Equipment a call. What a great experience dealing with Clark Heintz. Thank you Clark for offering this great package. Very good quality and finish. I should have bought this 35 years ago. I ordered and received this lift. Shipping was very quick. After minimal assembly, It works flawlessly right out of the crate. Operation is very smooth up and down. It makes a great addition to my garage and would definitely recommend to anyone. Thanks very much Clark, you are awesome to deal with. My expectations have all been met! I purchased a Pro 1200Max in early February. I wanted to get some time with my lift before I made a hasty review, I had done all the research for pretty much any lift available and chose NH Pro for all the right reasons .... price, quality and customer service. My expectations have all been met! I should have purchased a lift years ago. Ain't as young as I use to be and maintaining 3 motorcycles, 2 garden tractors, 2 quads and a host of other gizmos just does not bode well with the required body contortions. I just finished replacing oil lines, wheel bearings and seals, and front fender on my 86' FLT. I just can't imagine attempting that with my MC floor jack. I know I changed work level 10 times during the job, how nice that was. 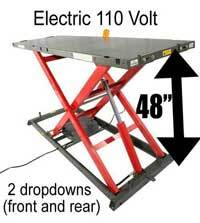 If you're shopping a lift table, give Clark a call, you won't go wrong!! Give Clark a call, you won't go wrong! I have the 1200 SEMAX and love it! It makes servicing and cleaning on the bike a lot easier. I have also used it to service my lawn tractor and have also used it in the up position as a work bench to also work on my weedeater. It took me some time to get things situated in my garage so that I could get my 2014 Harley Davidson Limited on it. Having worked in a Harley dealership as the Service Mgr., I was familiar with lifts that look like this one, but cost 3 to 4 times as much. This lift performs just like those lifts did, except this one has the rear tire dropout and roller plate that they didn't, and also came with a frame jack included as well. Been wanting one ever since I left the H-D Shop here in Danville and just got it this year. If you want one, be sure to check out Clark Heintz. Best lifts and prices I found anywhere and the quality is top notch! And most of the time he offers FREE Shipping on the lifts. And he has packages that include extras like bike frame jacks to raise the bike on the lift and a rear roller plate. I added a Condor front wheel chock to make getting the bike on and off easier with one person. Give Clark a call, you won't go wrong! Thanks Clark for a quality product that I look forward to using for years to come! I hope to be able to send you some pictures of my bike on my lift soon. I have one and it is a great addition to my shop. If your in the market I highly recommend this! I love the lift. Back in March of this year, I purchased a Promax1200 motorcycle lift. I love it, best thing I've bought for myself other than my bikes. I bought a service jack with it. I bought this lift. It is a great piece of equipment. Clark Heinz is good people!!! All I can say is that I wish I purchased this lift 20 years ago. It makes cleaning and maintaining both bikes ( goldwing - ultra classic ) a piece of cake, No more laying on the ground or kneeling down, it's saving my body. You were right when you told me that this lift wouldn't even burp with the weight of these bikes. Got the lifts and got them installed!!!! PRO 1200SEMax lift package is everything that I thought and expected it to be! The PRO 1200SEMax lift package is everything that I thought and expected it to be! It was a pleasure doing business with you so much so that I have already referred you to another fellow biker who will be contacting you in the near future, Thanks again. Received the lift yesterday, the pickup at the terminal was seamless, will inbox it today. Unbowed the ramps and jack, so far am very impressed by the quality, thanks for the quick shipping!!!!! I bought my lift used from a guy who bought it about a year ago. Was having trouble with the air cylinder leaking and the lift not being able to lift my bike. ( Previous owner operated lift empty -- lessons learned). Called Clark, explained the problem. He not only told me how to fix it but also supplied the gaskets AT NO CHARGE and Shipped them. That kind of service is rare and greatly appreciated. Will be over to buy the extensions very shortly. Beau Condon. Received the Pro 1200 lift in great shape. Crated nicely. Very well made lift. Ive used Handy lifts before and this is just as good if not better. Thanks again. I love it!! Best thing I ever bought! Good solid lift, I like it better then the one at my shop. Good price! Easy assembly. Clark made the experience personal and pleasurable. I will be back! Best lift I have used in the 13 years as a motorcycle tech. And I have worked for some of the best shops in Fla. before moving to Allentown, PA. Things have been great. It is seriously the best deal out there for a nice size, sturdy, motorcycle lift. Everything arrived in good shape, no damage. My only comment is the pedal, I wish it would operate a little smoother. The cotter pin and washer that holds the pedal in place on the valve doesn't seem like it will last long. But I'm just nit picking now. It's a great piece of equipment for the price and I should have gotten one a long time ago! Excellent air powered hydraulic motorcycle/atv lift. I have one and recommend it. I love my lift. Have used it for a lot more than just my bikes. Your customer service is as top-notch as your product! I received the Pro 1200 motorcycle lift today. Wow, I am super-impressed -- this lift exceeded my expectations. I used to work in a motorcycle shop, and this is just as solid -- if not better -- than the lifts we had there. I called a buddy over to see it. He has another brand (I won't mention the name) which is not made as well as this one. He's mad at me for showing it to him, because now he hates his lift more than he already did! Another friend of mine had one of the "foot pump" lifts, but his hydraulic pump broke in less than a year and he can't find replacement parts for it. I told him never to buy that one, anyway. Thank you very much for everything. Your customer service is as top-notch as your product! Top shelf products and customer service!! I am very pleased with this purchase. I contacted Clark with some questions about his product line. All questions were answered in a Professional & Honest Manner. After being convinced that this was the lift that best fit my needs, I placed my order. Three days later my purchase was at my doorstep. It was everything that Clark had promised. I will recommend this product to anyone looking for a Good Solid Lift at a reasonable price point for everything being offered in this package. The only way to work on your own bike. Very happy with it. Easier to work on the bikes! I talked with Clark several times before I purchased the lift. He was always able to answer my questions. I did a lot of research on lifts prior to my purchase, and couldn't find a better product and price. The lift was shipped and I received emails daily about the shipment. it arrived at the terminal here in Oklahoma City, Ok (Estes Motor Freight) right on schedule. They were kind enough to load it on to my trailer for me at no extra charge. I did give the forklift operator a nice tip. No transit damage, crating/packing was excellent. Got it home and put together and wow is it nice not to have to crawl around on the floor anymore. I have several friends who will be ordering one of these from Clark soon. Happy camper! Thanks Clark. So far it's been great! The shipping communication was first rate. It let me know exactly when it was going to arrive. I'm doing a major job on my Road King now and working on the lift makes it so much easier. I regret not getting the side extensions to make getting the bike on the lift safer and easier but budget concerns prevented the added expense, maybe I can purchase the kit later. So good, I will be needing another soon. Love my new lift. Looks like its built better than the three lifts the bike shop uses in my building. Got this lift to restore a 49 hydraglide . Only put it up n down a dozen time before the bike is totally in pieces. Now it's my work bench lol. Would highly recommend it to anyone or any shop. I am very please with the lift, it is quality built...comparable to another high end lift company that I have used for the last two years. This was a great alternative to the other lift that costs many $$$ more. Great product and well built...well worth the money. Thanks again for a great buying experience! I love it, and I'm thinking about...... building a new garage around it!! Thanks again for a great buying experience! My mechanic has definitely been happy with the lift so far! Everything arrived in good shape, finish is holding up well and still looks brand new. I am thinking about purchasing another once I have a second full time mechanic. I bought one this past spring and after a summer of use, I am ready to review this lift. The quality is great! I've used it lifting full dressers, lawn tractors, ATV's and simply as a bench with 360° access. This is the most perfect tool I purchased this year! Clark, you are by far, the best salesperson I have ever dealt with. I purchased 2 lifts for our shop and they are a great value. Clark is great to deal with and I will be purchasing more equipment from him in the future. The lift is working great. I have had no problems. I haven't got the lift completely put together yet. I have raised it up and down. It seems to work fine. I am very happy with it. Handy lifts are made 40 miles from me. I could not justify their price for my personal use. If someone asks me about the lift or the experience I would probably give it a 4 or 4.5 out of 5. Overall it looks like a quality piece and your customer service (and marketing as I’ve already noted in the above referenced thread) approach excellent. I would say that I had 2-3 minor issues. 1. The wheel vise needed to be shimmed during installation so it wouldn’t bind on the table. 2. After speaking with Clark following the delivery and uncrating I learned that one or more of the zerk fittings typically are broken/damaged during shipping and so they normally include two (supposedly in a plastic bag, though I found mine floating freely around in the crate during unpacking). In light of this it would have saved me a phone call (and Clark too) if that was simply noted in the instructions. Perhaps including a note about how many zerk fittings are found on the assembly and where they are so that the new owner can check. I might be a tad picky about such a thing, but since I’ve spent more than 2 decades writing repair manuals for cars/trucks/motorcycles and boat motors, I tend to zero in on such details. 3. And related to those instructions I reference in #2, I’m still not 100% certain how to properly use the lift dolley that I purchased along with the lift. That said, I would whole-heartedly recommend both your product and your company. The lift has been working out very well! It has made working on my motorcycles much more easy, no more kneeling on a cold concrete floor. The only problem, not really a problem, was getting out of my truck and into the garage. I have no regrets on the purchase, other than I should have done it earlier. No problems so far. The lift is really well made. I am so very pleased with the lift. Everything has worked out perfectly! Clark was very helpful during the sales process. While waiting for my money order he processed everything and had my lift ready for shipment based simply on my promise to send payment. Very impressed and I appreciated his trust in me. I have one friend nibbling to purchase the same lift as me. Love it. Spent last week sinking it into my garage floor. Have a lot of friends jealous and interested. The lift is overall fine and would give it a B rating compared to others I own. The thickness of the metal is below others. The paint finish is thinner and less protected than others. The front end extension needs to be redesigned; for example, a sliding locking platform all one unit. I will only install the extension in an emergency since it is very cumbersome to install. 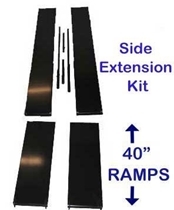 The ramps are angled too sharply for a Harley; make a longer ramp as part of your upper package deals. I like the rear drop down panel. I like the extension/side panels. I like the rear platform supports and would like the same on the front. Most lifts I have owned fail due to bearing wear, the supports extend bearing life. 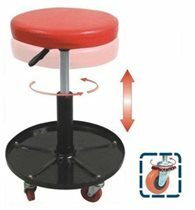 I like the rolling stool and motorcycle lift. I am using it and it is the best lift I have ever owned, bar none, thank you for the guidance on my purchase, for I am extremely happy. Great lift & great Company, great job people. Very happy, Clark was great to deal with. I intend to purchase another next year. Except for a faulty foot pressure regulator (which was replaced immediately) I am very pleased with the lift and have used it almost constantly since the purchase. In fact, I intend to purchase another next year. I'm very happy I pulled the trigger and purchased the lift, I'm very impressed with the quality and I'm planning on purchasing another one in 2015.
back in the summer i bought a pro 1200 lift from you, with the side pieces. i have been unable to even take it out of the crate until today as i worked a seven-day-a-week job for six months. but i broke it open today, all set to put it together, and was surprised to see it already assembled. all i had to do was bolt on the front wheel clamp. very nice. it works great-- fits my old trident perfectly and lifts it to full height in about 8 seconds. it's a very nice piece, well made and uncomplicated, not heavy and easy to move around. Its been good so far. Had to rework a little in places but they were minor manufacturing sloppiness but that's the world today. I like it just fine. My old back loves it. I made a winch system for the front that I want to come show Clark early next week when I get to concord again . Thank you for following up on sale. I resold this lift to one of my customers. He is using it as a repair table for large construction pump and generators. He said it’s working great for his application . The equipment he services have wheels so he rolls them onto the table and lifts them to a comfortable working height. Your price and free delivery are the best on the web. I hope I get future orders from there other locations. I'm really enjoying it, I've done a lot of projects on the my bikes (98 Road King and 2010 Ultra). Everyone who comes into the shop is blown away by the quality. My new lift is Awesome. My new lift is Awesome. I absolutely love it and have used it a lot. I use it for a work platform for many other projects as well. I am also the envy of all my friends. Thanks again for the prompt pedal replacement. It works great. Looking forward to doing business with you in the future. I am very happy with the lift. It has been used almost daily without any issues. Thank you very much for a great product. The lift exceeded my expectations and at a price point significantly lower than the competition I couldn't be happier. It is exactly what I was looking for. Thank you. I bought the motorcycle lift as a gift for my father for Christmas. I assembled it and gave it to him Christmas morning. He loved it, but after having it go up and down twice the foot petal broke. We contacted the company I bought it from and a new pedal was sent out right away. Besides the pedal breaking, the lift is great and one of our bikes is on it as we speak. We would definitely buy another with out a doubt. The company was great to deal with! We were very happy how quickly things where taken care of and the pedal that we got was better then the first. From using it the last few weeks, I would rate it a 5 star and and if we can make more room in our garage we'll be getting another one! I was going to send an e-mail just after receiving my lift, but with the holidays, I guess time put it on the back burner. I had every intention of dropping you a short note to let you know how impressed I was with your help on the phone placing the order. Not only was my order handled with the utmost professionalism, but I received the lift the next day! I was totally surprised to have it show up in less than one day. Thank you for a great experience. I will have no reservations recommending you and your company to anyone who asks about the lift. Please thank Clark for me and thank you once again! Very happy with the price and quality of my Pro1200 SE max!! Thanks for the great service! One lift table...Sure makes things easier! My husband was absolutely tickled with the lift. He has used it a couple of times and he is very happy. Thank you again. I got this for my husband for Christmas and he loves it. He has his bike sitting on it right not, hasn’t had too much time to be working on anything. He thought it was of good quality, color was good ( fits into his “Harley” color scheme). Impressed that I thought to get him something like this. I believe I spoke with Clark when I ordered it, he had all the answers I needed and helped me with the shipping arrangement. Winner winner. I am very pleased so far. It was a X-mas gift to me and is just what I wanted. I've been very happy with the lift. Operation is fast, smooth, and easily handles both of my bikes. Clark is great to deal with. I had one of the smaller ramps that was missing when I did the inventory and he Fed Ex'd it to me. I really like the Motorcycle Lift! The service was one of my best in dealing with the purchase, working with Clark Heintz couldn't of been any better. Not even a scratch on product when arrived, packed very well. The quality was better then I expected, built to last. This would be the first choice in Bike Lifts, I would recommend to anyone. The lift is awesome! Took some effort to get it off the truck but that was mostly the truck driver’s fault not lining up square to our loading dock. We got it unpacked, put on the air fitting, pushed down the pedal and AlaKazam, it lifted right up. Had the bike on it ever since and still working on it. Great piece of equipment, very well made and my Son was really impressed. I think that was the most rewarding part. I bought the lift for my husband for Christmas and he loves it. It ended up not getting here until the day after Christmas but that was not your company's fault it was the shipper. Great quality and my husband had one question while putting it together and called and immediately he had his answer. The lift is awesome! Couldn't be happier with it. You guys did an awesome job. Thanks. I purchased this for my husband. He's a certified Harley Mechanic and opening his own shop soon. This was one of the things he desperately needed. He's very happy with it so far. Thank you! I have to say I am very happy with the purchase. First off, the delivery came much quicker than I anticipated, and unpacking and setting up the lift was pretty easy. I just recently swapped out the swingers, rear shock, front forks and front wheel on my Victory XC and the the lift was invaluable, and performed flawlessly! Thanks again for a great product and the quick turn around on my order! The lift is working great! My husband loves it. It was exactly as advertised and what we expected. I'm the best wife ever thanks to this awesome Christmas gift! 1st Class Quality Lifts and Customer Service!!! I purchased two Pro1200SE lifts for my garage back in October 2014 and they are of the utmost TOP QUALITY of any lift I have seen or used and are working outstanding. I HIGHLY RECOMMEND this lift to any consumer looking to purchase a QUALITY lift which includes all the accessories and no need to purchase them separately. Clark had answered all of my questions that I had prior to purchasing and add. I ordered my lifts on a Saturday and they were delivered the following Friday! You will need a forklift of some sort to get the lifts out of the truck as they are extremely heavy FYI. Thanks much NH Pro Equipment for the great experience! I am very pleased with my lift, it's exactly the way it was shown on the web site. It was delivered in a timely manner and I am very happy with my purchase. The lift is EXACTLY as advertised, which is great. Being in the customer service industry myself, I can tell you that my customer service experience with your company was EXCEPTIONAL. I got updates every time my lift stopped while it was transit. I would definitely purchase from you again. The Motorcycle Lift is wonderful. My fiancé loves it. Everyone that I spoke with from this company was wonderful and helpful. I will most certainly purchase from this company again. The quality of the lift is fantastic.. Thank you very much. Very pleased with the lift I purchased from you. Really a very nice lift from all aspects. Also it was a pleasure dealing with you guys. Shipping was quick and the tracking updates on the shipment couldn't be beat. I have used the list a few times but so far it is working out great. I ordered my lift feb 23rd and it was delivered den 25th,that's what I'm talking about. Clark you are the man and a pleasure to deal with,thanks so much and I really appreciate the care and pride with which your products are packaged. Lift is very well made,solid and very sturdy. Very happy with the purchase and the service from Clark Heintz. I actually purchased the lift with the side plates without checking to see that there was a special being offered. Clark switched my order to the special that was being offered which netted me the lift, side plates, the flat jack and free shipping. Clark even fronted me the $29.00 difference and let me pay it later after I got the lift and was satisfied with it. The lift is well built and was easy to assemble and works great. I put it to use right away, changed front tires on two different bikes. It was delivered just a few miles from the house and I picked it up at the loading dock, it was packed real secure. It will be getting a lot of use as we have 4 motorcycles in the garage. All is good, the only thing I would do differently is make the ramp longer. My bike bottoms out slightly with it. It's not a problem though, I own a metal fabrication company and made a new one. I am happy with it. The delivery was very fast and the email tracking was nice. I walked into the shop to inquire about purchasing a lift that was on sale, great customer service and completely pressure free. I ended up buying one but paid less due to no shipping. I should have sprung for the extensions but that will have to wait. Easy to load up and only took two people to unload when I got home. Very good packaging to ensure nothing got damaged. It's all set up and ready for use. Will save tons of time crawling around on the ground. Already showing it off to friends. Thanks again for an honest transaction! The lift has been working great and I am very happy with the purchase. Couldn't be happier. Works just like it should. Better assembly instructions would be a plus though. Able to get lift set up, and the bike on there now. Let's say I'm happy with my purchase. Glad I bought "your" lift and not one of the MANY OTHERS. I am really digging my lift. Sure works great with the race bikes. I have been using the lift and it works great !! Love it. I will be purchasing some other stuff for the lift. Thank you and very happy. The lift has been working great. I am very happy with the purchase. I tell everyone I see about my lift and what a great deal it is. I couldn’t be happier with my lift. I got the side extensions with it and they work great for servicing my riding tractor. They also make it easy to ride the bike up on the lift. I stopped by and told Clark how happy I was and he was very pleased. Really a great guy. I tell everyone I see about my lift and what a great deal it is. The motorcycle lift is "JAM UP" I couldn't ask for a better Lift! 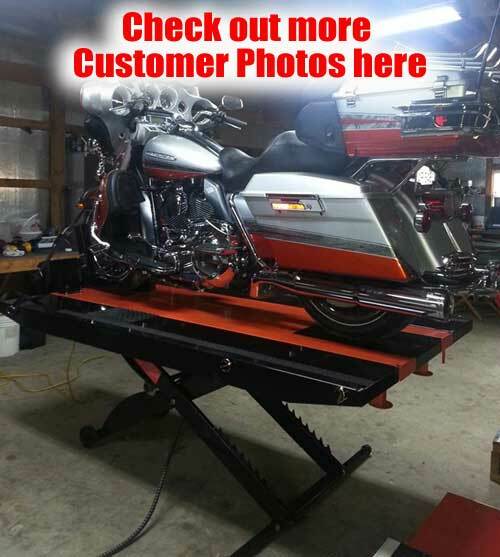 I bought the PRO 1200 lift for my home motorcycle shop after reading many positive reviews. I own a BMW R1200GS as my personal bike and ride on-duty for a City Police Department. I just retired a 2006 ElectraGlide and currently ride a Honda ST1300 for on-duty use. The PRO 1200 lifts all these bikes with ease. I have it attached to a 30 gallon, 1.6 HP compressor but don't need nearly this much pressure to operate the lift. In fact, the lift works perfectly as soon as pressure starts to build. I hosted a BMW Owner's tech day at my house and lifted many, many BMW's with zero issues. I have absolutely nothing bad or even marginal to say about this lift. Quality product that would do very, very well in any setting from home to professional shop. Thank you! It was a smooth trouble free transaction. Can't believe I waited this long to purchase a lift, but it is worth every penny. The lift works fine, I'm totally happy with it. Thank you. Received my lift today. I've been putting off buying one for a long time now. After talking to Clark a couple of times I did purchase one. The whole experience was good and the lift is flawless in its operation. I have a 2013 Streetglide and lifting it is a breeze. I would recommend it to anyone looking for a lift. Lifts it like it was a much smaller bike. I'll never lay on the ground again. Thanks again for the great sales experience. Got everything, it all works great, thanks for the great customer service. I love my lift. It makes life so much easier. Tell Clark and the guys I'm glad I bought this lift. I also recommended to a friend in Buffalo NY. I bought the PRO 1200MAX MOTORCYCLE LIFT PACKAGE a year ago and have been using it almost daily. Great lift table. I use it for my heavy Street glide and My not so heavy 84 Shovelhead FLH. Thanks to Clark and the guys at NHProEquip. All's good with the lift. One minor fitment issue with the wheel vise, but I was able work it out. It’s great!! ! ! ! The lift has been working GREAT ! real happy, Clark was GREAT to do business with I look forward to doing more in the future. The lift is everything I wanted it to be, it has worked flawlessly on 3 bikes projects and more to come. I would recommend it to anyone that does not want to work on their knees. I just wanted to let you know I received my lift table yesterday at Estes trucking in Nashville. It was well packed and looks to be in good condition. I did not get home in time to unpack it. I hope to get it set up this weekend. I'll let you know how it goes. I want to tell you it is nice to do business with someone who does what they say they will do. I am impressed how fast you shipped this out and how fast I got it. So far this has been a very good buying experience. I expect the quality of the lift will be good as well. I hope to do business with you again. The lift has been very good. I just stopped by to replace the foot pedal which was defective, i haven't installed the new one yet to test it. Thank you very much for reaching out to me. My boys and I use the lift on a daily base we love it , My back loves it , we have had no issues at all , Great product. My knees and back will appreciate it. Picked up unit in Springfield ma trucking terminal, everything was packaged very nicely and in great order. Got unit all unpacked and set up last night. First impression was great quality and well made. Operates smoothly and looks awesome. My knees and back will appreciate it. Thank you for your great service and knowledge of your products, would recommend you and your products to anybody inquiring. I love my Pro 1200 from Clark Heintz! The lift works great haven't had any problems or anything that it can't handle. Thank you for a great product! This guy will treat you right. My Softtail is sitting on a lift I got from Clark Heintz tools. If you haven’t been, stop in. It’s a great lift and well worth the money. This guy will treat you right. The PRO 1200MAX MOTORCYCLE LIFT PACKAGE in value and lifting capacity. The lift easily raises 1500 pounds and the accessories include make it an excellent value. Top that off with FREE SHIPPING and deal becomes unbeatable. I researched online before deciding on this package and found no other lift of this quality at anywhere close to the price. The Handy 1000 lb. lift sells for $999 at Northern (No accessories and shipping is extra). Clark and his Staff provide EXCELLENT CUSTOMER SERVICE and are a pleasure to deal with. I will certainly do business with NHPROEQUIP in the future and highly recommend this company to anyone looking for the absolute best value in motorcycle lift tables. A sincere thank you to Clark and his team. Nice work on these, man! It's awesome, as expected. No problems here....Just the usual scratches and scuffs....Nice work on these, man! They are working out great!! The lift is working great, we are so happy with it. I just received my lift and after 25 minutes of un packing, my bike was in the air. NHProEquip shipped it fast and it was well secured on the skid. I highly recommend the lift and the company. Just wanted to say thank you for the fantastic customer service you provided to me recently. I emailed you last Saturday telling you my inside bearing broke on my Pro 1200 Table lift and you responded that day. I sent you my original invoice and I had my new bearing within a couple of days. What you did is not heard of anymore and I truly appreciate it. Lift has been working out great! I added my own textured bedliner spray paint down the center for added grit and texture making loading a bit easier. A great lift and at a great price. The lift is great. I'm trying to buy another one. Great deal thanks again, Clark - loving it! These lifts are awesome! Our only regret is not buying them sooner, Thank you Clark Heintz! I ordered my lift on thursday and i recieved it friday morning at 11:00 am....unpacking was easy and the instructions were also easy...after assembling the lift i worked on 2 bikes and realized how did i survive with out this.....by far a great deal i did my home work on lifts and bang for the buck you can NOT go wrong on this.and Clark in sales .....sorry for all the questions but top notch answers I will be buying more equipment from these fine folks....Thank you! Love this lift! Thanks, Clark! Working out great, I'm a one man show so having multiple lifts helps me so I can bounce around I have two lifts now. The business is growing so I need to keep up! Bought the Pro 1200 lift from Clark and I couldn't be happier with it ! Operates flawlessly, and is sturdy and stable.....not to mention it was a great bargain ! I couldn't be any happier with it. Awesome lift. I'm very happy that I purchased the side extensions. They make the lift complete. I'm very impressed with the lift. If you need any help by recommendation have anybody else interested in your lifts to just ask me how much I like mine. I should have bought one years ago. Working mint so far, just need to get extensions for it. Came in and purchased a pro lift 1200. Can't say enough of these guys! Awesome lift, finished my busted belt swap, and now the ironhead, who will be rebuilt! Got my 1200 SEPromax motorcycle lift in. Everything was just as described. I couldn't be happier. Clark informed me of all the changes and upgrades to the lift and they are great. Clark is a good man to deal with and sells a great product. MONEY WELL SPENT. I have this lift and use it for my ATV, lawn mower, motor cycle. I recommend it to anyone for their own shop or a business. Highly recommend doing business with him. I bought this setup in the fall and the only day I could get it was on a Sunday. This gentleman planned his day around me and was awesome to deal with... and the lift is worth every penny. Been using my lift for a couple months now and I love it, had a friend buy one too after telling him how good it is. Great -I really like it. Don't miss lying on a creeper trying to work on a bike less than 6" off the ground. I bought one, real good quality... satisfied for sure. The lift is awesome!! I use it quite a bit, even for small projects. I love my lift, best $ spent in a long time. Works great, looking forward to changing my rear tire with the drop out rear plate feature this year. The Pro 1200 is working out great, Clark! Makes cleaning and working on it 1,000 times easier. Thanks again! Thank you for the pro 1200 air lift and all the accessories that came with it. Great piece of equipment. Couple bikers in my shop the other night were very impressed with my new Pro 1200 lift. Dudes were like wow man that's nicer then my Handy lift. 1st buyer, I bought the 1200 max motorcycle lift not only was I very satisfied with the lift but I am also very satisfied with the customer service . I deal with people all day long and your company made me feel " the customer comes first".. Very polite and helpful . I wish everyone did business the way you do! Thank you so much for your product and support! We have only used it a couple times. But it works well. The guys are happy with it! Awesome. Use it for atvs bikes commercial mowers. U name it. I want to say thank you for the outstanding customer service I received from Bob! This lift is awesome and the quality is unbelievable! I ordered this package Tuesday. It arrived today, Friday, to south TX. Took me a few to put it together, no instructions necessary, it's pretty self explanatory. Put my bike (2011 Ultra Limited) on the lift, tied it down, hooked up my Dewalt 6 gallon pancake compressor and away she went.. no issues whatsoever.. raises super smooth and lowers almost as smoothly, in a mild jerking drop, but nothing that concerned me. Bike was stable on the lift and will bring my oil changes to eye level on my little creeper chair I already had. One important word of caution: Invest in some anti-slip tape to put on the side extensions.. maybe my garage floor is dustier than most, but it was slippery as snot.. made the trip to hardware store and bought 16' of it. I'm putting 3' per side ramp. They work fine and a very good value for the money. It's working out awesome!!!! Should've ordered the side extensions with it. It's fantastic! Fits all the bikes well; makes work an ease. Very happy with it. So far so good, thanks. Matches my branding colors and logos. Ill have to grab a pic of the other table too, again colors are great made the purchase even easier. Bought the Pro 1200SEMAX motorcycle/ATV lift. The price was right, the service was great and the lift is everything it was advertised to be. Thanks Clark, I will highly recommend you to others. I LOVE it - sure beats bending over to work on the bike. I used to have a Pitbull Lift Jack. I was the only one around here in Decatur, Il. that had one. Now I am the only one in Decatur that has one of these awesome lifts. Love being able to work on the bike and not having a sore back. Thank You. Works great one of the best purchases I've made. Great lift for the price! I spent days researching lift tables and always wound up back here. Great customer service and very high quality product. I have tears in my eyes! Nah, I'm kidding bout the tears but not far from it! I'm 57 yrs old, had motorcycles my entire life and why I never looked deeper into one of these I just don't have an explanation for! Anyone can own one of these and NHPE has a "financier/lender" if your strapped for cash! Thanks for a great deal. It's working out great. I have a small one man shop and have been using a Handy Sam for many years, As business has grown I've needed a second lift for more then a few years but with the fear that I would lose bike parking space. With a really productive winter rebuild season and having a 2016 Road Glide on my lift for a month with extensive work and bikes waiting to be worked on I knew it was time to quit screwing around and not worrying about parking space. Thanks for a great deal. PRO1200 does good work to get bikes ready to leave out for Smokies for big ride. Working great! I'm very happy with it! Just a super transaction..The lift arrived really fast. It also arrived in PERFECT condition. Why can't every company operate like these folks do??? Thank you all again...as Arnold said "I'll be back"
Got my lift set up....it's sweet! I am actually really impressed. Was skeptical with the low price....but has proved me wrong. Works very smooth and easy to use. Shipping was smooth...assembly was a breeze. Only complaint would be the rubber on the sides of the chock....wrinkles when tightened on the tire.....so I'm sure that will stretch out over time. I will likely replace it with hdpe plastic. Lift is working great especially with the new longer ramps. Thank you. Lift works great for my 2010 Ultra Limited - as expected, thank you. I love my Pro 1200 lift. For the price you can't beat it. Mine sees a lot of use and it's still holding up well. Best lift for the money, bar none...anyone in need of quality tools that stand the test of times at a reasonable price? Go see Clark Heintz in Bow on 3a. Lift was easy to assemble and works excellent. I was one that did not heed the advice to purchase the side extensions at the same time and figured I'd see if I really needed them. Unlike my old cheapo Harbor Freight lift, I was unable to ride my ultra onto the lift without side extensions. Therefore, I went back to pick up the side extensions a few days after purchasing the lift. Make sure to put air tool oil drops into the foot pedal every so often and consider installing an inline water separator/filter for service free prolonged life. Love the air tables been using them for over 3 yrs now and never a problem. Have the 4 wheeler sides for them as well! Great for needing that extra space for parts! Thanks guys! Working out just fine. Thanks for asking. I did a lot of research before purchasing the Pro 1200 lift. I look at just about all of them out there and for my purposes of simply DIY maintenance, this seemed to be the best value for the dollar. I had a few questions so I called NP Pro Equipment and spoke with Bob. Bob was very personable, answered all my questions, and seemed to be very centered on providing a good customer service experience. Based on my discussion with him, I decided on the PRO 1200 SE MAX as it came with everything I was looking for in a lift. I received the lift within 10-days of placing the order. Extremely fast delivery considering I ordered the package during the Christmas/New Year Holiday. The lift arrived in one wooden crate, approximately 650 lbs, and was easily transferred into my garage by the freight company. The lift was well packed, easy to unpack, and fairly easy setup. I was able to operate the lift with a small 9-gallon Porter Cable compressor that I use with my nail guns however, it was a little slow on the final few inches to reach the top position when loaded with my 2015 Road Glide Ultra, 960 lbs. The lift is well constructed and sturdy. In my opinion, the side extensions are a must to load the larger touring bikes as they give you feet a place to touch down to balance the bike. I would highly recommend the lift, you will not be disappointed. I like it. Both bikes spend a lot of time on it. I need a bigger garage! Incredible! I am beyond happy with the product. Used everyday in a shop for the last 2 years. 0 issues. Plan on at least picking up a couple more in the near future. I am a professional golf course mechanic who uses lifts everyday and has experience with several different manufacturers and configurations of lifts. I also have several atv’s, motorcycles, golf carts, zero turn mowers, snowblowers, etc. that I work on for customers and friends. I purchased this package last week and I am excited about my purchase. Not only can this lift handle all the variety of equipment I work on, it has better construction and several clever features that make my work safer, easier and a lot more fun. Thanks for such a great product! The customer service was as others reported phenomenal and I had my lift set up with a torn apart machine on it within 26 hours of placing my order. That is not a typo 26 hours and arrived in perfect condition. Amazing. Easier than ordering a pizza. Love the unit, now I have a snowmobile on it. There has only been a few days that some thing or another that I have not had a use for it. Thanks again Clark! The lift is great - many uses! The lift is solid! Works the way it's advertised! The service was great. my shipping address is difficult for shipping companies to reach, but the guys at NHPro worked with me and got it arranged so I could get delivery easily. Also, rather than sell me something I didn't need, they took the time to walk through my needs and kept me from buying something I wouldn't find useful. I will absolutely come here first for my ship equipment, and I will recommend them to anyone who asks! Thanks guys!!! Still works great, lawn mowers, golf carts lifts everything with ease, thanks. Love the lift Clark Heintz sells for the price - you can’t beat it and it’s the real deal. These lifts are awesome. I bought 1 and loved it so much that I now own 2 and the people that sell them are great folks. Highly recommend doing business with them. I really enjoy my lift. Don't know why it took me this long to reply but we are LOVING THEM!!! Cannot believe I went this long without one! Adjusting pushrods on my Pro 1200. Works great! Cannot believe I went this long without one! Put the lift together last night. Works great. I wish I hadn't waited so long. I absolutely love my pro-1200 lift. Absolutely love it. I will be looking into purchasing another. It has been a godsend. No more breaking my back while work working. I have had my lift for a few years now, it’s a 1200 model. I couldn’t be happier, it makes bike maintenance so much easier. Delivery was a snap and set up was easy. Before I ordered it online, I called with a few questions and that cinched the deal. Money well spent. Will be staying with this company. Bought the Pro 1200 lift, small shop in Mo. This lift is really well made, simple set up,(little bit heavy for 1 person) Was impressed by the lifting power it has. Have used it about a month. Had an issue with it slowing down at the top. Called NHPro,they made the suggestion to turn air pressure up a bit. that did it. Was a good feeling to know they stand behind the equipt. they sell. Will be staying with this company. Best investment I’ve made in a while! Best investment I’ve made in a while! Thank you! The PRO Side Extension Kit accessorizes the PRO 1200 Motorcycle Lift. The PRO 1000SJ Motorcycle Service Jack accessorizes Motorcycle Lifts and ATV lifts. 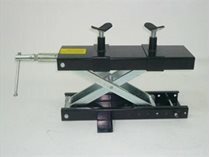 The PRO Roller Plate accessorizes the PRO 1200 Motorcycle Lift. The rubber lined PRO Wheel Clamp accessorizes the PRO 1200 Motorcycle Lift. SALE This pack of 2 Quickloader tie down straps (QL1500) is for light to medium duty. Use when 2.5 ft to 12 ft of strap is needed and load weighs up to 500 lbs. Quickloader QL10000 tie downs are for commercial duty use. Use when 3.5 ft to 27 ft of strap is needed and load weighs up to 3300 lbs. Quickloader QL1500 is for light to medium duty. Use when 2.5 ft to 12 ft of strap is needed and load weighs up to 500 lbs. Quickloader QL3000 is for medium to heavy duty. Use when 3 ft to 15 ft of strap is needed and load weighs up to 1000 lbs. Quickloader QL4500 is for heavy duty use. Use when 3 ft to 15 ft of strap is needed and load weighs up to 1500 lbs. PRO FP Foot Pedal for use with PRO 1200 Motorcycle Lift. PRO SS SOFT STRAPS / deluxe ratchet straps help you tow your motorcycle with ease.